The following was updated on November 22nd, 2016. Here’s an example of why I go out of my way not to mix honey from different hives. The honey on the right was taken from one hive, and it tastes heathery. 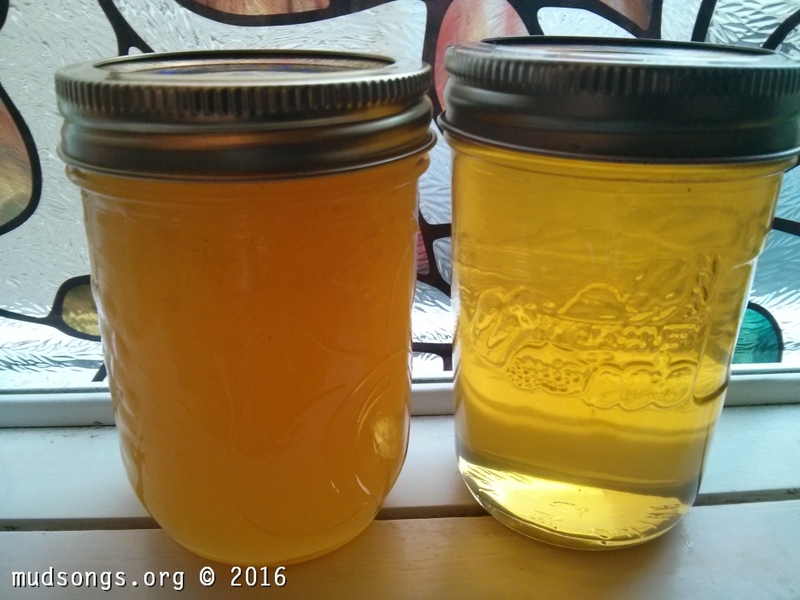 The honey on the left was taken from another hive, and it has a more earthy flavour. Both were harvested on the same day. The two hives are about 2 metres apart (7 feet), but the bees from each hive favoured different nectar sources, which resulted in slightly different honey from each hive. The favouring of specific pollen and nectar sources is called floral fidelity. The bees find an abundant nectar source and they stick with it instead of wasting time jumping from one type of flower to another. That’s why you’ll often see a flowering tree loaded down with honey bees while at the same time not a single bee goes anywhere near your beautiful Forget-Me-Nots. The results of floral fidelity are lost in most large beekeeping operations that have to blend all their honeys together. Not me. A honey bee from a normally friendly colony stung me in the arm today because I was wearing a black t-shirt. I often wear minimal or no protective clothing around this particular colony because I know the bees are not at all defensive (not at this time of the year, anyway). Today was no different, except I forgot I was wearing a black t-shirt. As soon as I opened the hive, I noticed a few bees zig-zagging back and forth like they were hyped up on caffeine — not at all a relaxed flight pattern. Once the bees start whipping around like wasps, it’s time to turn around and leave. Come back later with a veil and gloves and a smoker if you got one. But I thought, “Nah, these bees —f%$#@!” Zap, right under the sleeve of my t-shirt. The little bugger got me good. I’ve been told many times not to wear black around honey bees because, supposedly, honey bees have evolved to be more defensive around anything big and black. Most creatures in the natural world that are big and black (e.g., black bears) are a threat to honey bee colonies. When honey bees see something big and black coming their way, it’s usually better for them to sting now and ask questions later. I’ve heard how the bees will even sting the ankles of people wearing black socks, but I wear black boots every time I’m around my bees and I’ve never seen them go for the boots. For a variety of reasons, I didn’t take much stock in these particular campfire stories — until day. My single experience of wearing a black t-shirt and getting stung for the first time around some bees that aren’t normally defensive isn’t much of a data set. It can’t be used to arrive at any kind of scientific conclusion. But I’d rather not wait for science if it means I have to get stung a few more times in order to prove the black bear hypothesis. Getting stung once is enough. I’m a believer. I won’t wear anything black around my bees again. August 08/14: For the sake of science, I wore black and then white around the same hive of bees. The bees came in for the sting while I was wearing black and ignored me while I was wearing white. Case closed. Closed enough, anyway.